Last Saturday, I bicycled north from Madison for much of the day. Once the thunderstorms passed and the sun came out, it was beautiful riding. Biking is a great way to observe the countryside, but sometimes you get bonuses. Up around the line between Marquette and Waushara Counties, I saw some telltale signs of Old Order Amish presence -- houses without electrical lines going to them, mountains of Amish clothing hanging out to dry on lines and, yes, horse apples all over the right edge of the road. There are communities in nearby Green Lake County, so no surprise. Eventually, I saw a small buggy ahead, drawn by two horses. I passed it and waved to the old guy driving, who waved back and nodded. Before I could even start to think about how interesting it is that we're getting such robust growth of Pennsylvania Dutch (or whatever you prefer to call that language), I saw two bikes coming the other way. 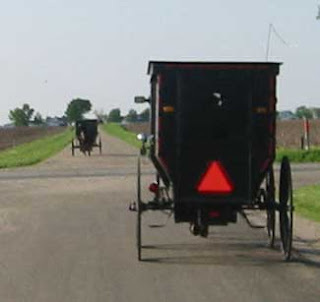 In that area, seeing Amish buggies is more common than bikes. The first rider was a guy and when I waved at him, he grinned and waved and yelled out "Tag!" Just as I start to wonder 'wait, what, German? ', the second, a woman, comes and I wave again and she hollered back "Tag!" No doubt about it ... Germans. North Germans, in fact, judging from the very clear velar fricative at the end there. 200 yards or so, two very different Germanic languages. Sounds to me like you ran into some Plautdietsch speakers down from Canada. They're traditionalist Mennonites too, like the Amish, but from the northern coast of Germany rather than Franconia like the Amish (or Carinthia like the Hutterites). Nah, the guy in the buggy was clearly OOA and the cyclists were just plain old German tourists -- Wisconsin is swarming with them these days. Or three Germanic languages. You were speaking/thinking in English, oder?? Believe it or not, I originally wrote the post that way, around three different Germanic varieties -- in large part because my English is FAR from the local English, but decided that was way too obscure. So, yeah.